When I read in the New York Times that Rolling Stone magazine had premiered a pop/rock track from an album to be released shortly by the Pope, I assumed it was a joke. Having checked it out, however, I discovered it to be true (see here). It seems that our Western celebrity culture has engulfed everything, even the Vatican: Simon Cowell has a lot to answer for. 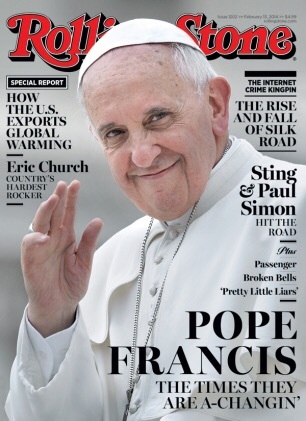 I find it a little disappointing that the Pope should seek to bask in the reflected, superficial glow of showbiz. It would be far more meaningful and popular in the best way if he were to make real, doctrinal changes in relation to, for example, the requirement for priestly celibacy and the need for female religious authority within Catholicism. At the upcoming Synod on the family, he will be presented with the opportunity to relax stringent Church moral norms regarding contraception, homosexuality and divorce. Will he be prepared to make the hard choices, or is a nod to celebrity culture as far as he is prepared to go in keeping up with the zeitgeist? Francis talks the talk, but will he walk the walk? Of course there is always the chance that the Pope’s pop debut is a shrewd and calculated effort to get public opinion behind him before attempting doctrinal change. If this is the case, then the Pope will have transcended anodyne pop culture: is this the precursor of meaningful change? Now that would be real rock’n roll! Non-Religious Women in the Church: In my last post I mentioned that, as a feminist theologian, I often find myself between a rock and a hard place. The same could be said of all or most women who spend a significant amount of time within an environment where male power and authority are even more pervasive than in the secular world.